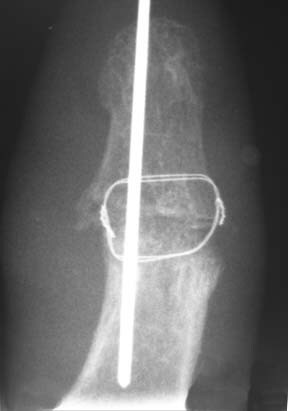 This page shows a thumb IP joint fusion for severe arthritis. This is a interphalangeal joint of a thumb (the one on the end, toward the fingernail) that has severe arthritis. It is painful, deformed, and pretty much useless. The patient has tried all of the non-surgical treatments listed on the Arthritis Page, but just had too much pain. It interfered with their activities and enjoyment of life. They decided to have a surgical treatment called a fusion, in which the joint is cut out and the two bones allowed to grow together. There is no joint, so is no motion, but there is also no pain. This is a thumb IP joint fusion. 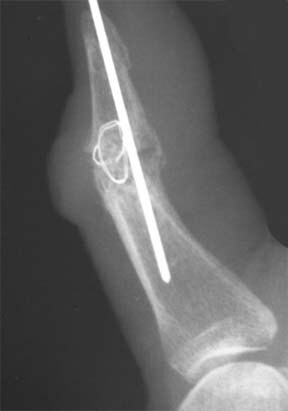 There is a stainless steel pin (very thin, about 1/3 of an eighth of an inch) placed across the joint, plus two very very thin stainless steel wires (about 0.001 inches) placed through the bones and twisted tight. This xray was taken in the operating room. If you want to see the actual surgical procedure, click here. Be warned: it is graphic. 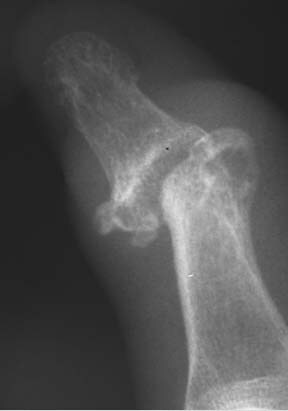 Over a period of about six to eight weeks, the bones join ("fuse"). The larger pin is taken out in the office. It is quite loose by this time and comes out without any pain. About 25% of the time, it just falls out by itself. The smaller wire is left in. About 75% of the time, the fusion is solid, there is no motion, and no pain. About 20% of the time there is a little jog of motion, no pain, and we accept it. About 5% of the time there is motion and pain, and we have to revise it (do the surgery over again).